Our security operation center supports monitoring your systems and uses therefore the software you are using in-house. We prefer this approach compared to installing our own software due to the fact that you still remain the owner of this security critical component, but we support you to configure the software and to supply you with needed personnel capacity, so that you can fulfil this task as cost efficient as possible. In case of a security breach, we are immediately alerting your organization and we are organizing emergency procedure that we have defined together with your teams. In addition we are creating security reports regarding all security relevant incidents within your IT environment. 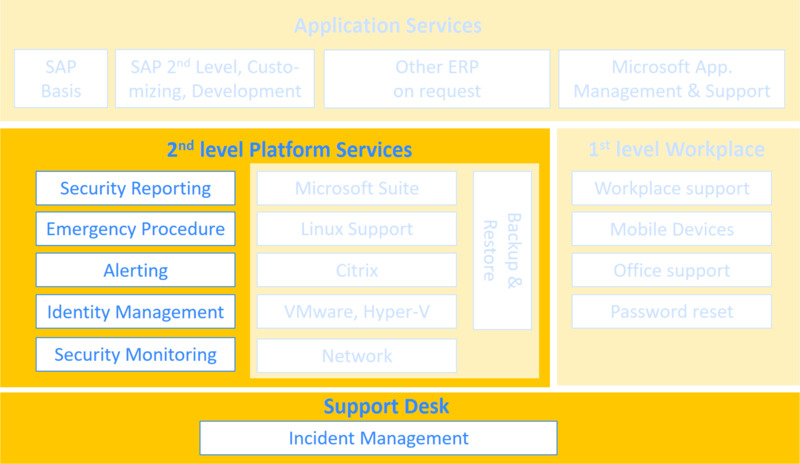 Use us as extended workbench of your IT or as a partner that takes over the complete monitoring and alerting. In addition, we offer you support in your identity management and to operate this security relevant component. For example support in managing your Microsoft Active Directory. You would like to know more about our concept? Please click here.